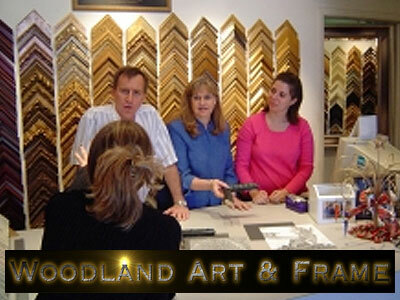 Woodland Art & Frame has been serving Montgomery County longer than any other custom framer. Located in the Borough Park Shopping Center since 1981, we celebrated our 25th anniversary in June, 2006. We are truly your best value in custom framing using quality materials and an expert, experienced staff. We keep our prices affordable. Cindy Plummer, owner, with her husband Dave (CPF), have been personally serving the community by going the extra mile to make sure that you get exactly what you want and showing you new and exciting ideas. Please visit our home page where you may view a slide show which will give you some new and exciting ideas for your treasured items. Now, the only shop in the area with visualization technology. See your framed picture on screen before you leave our office online!